You’ve heard of the proper way to boil a frog, right? 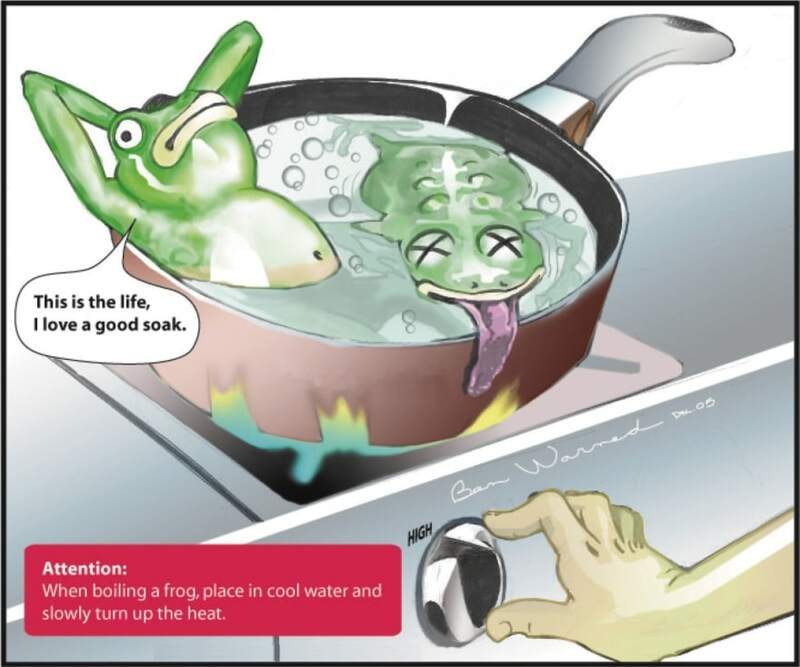 The premise is that if a frog is put directly into a pot of boiling water, it will jump out, but if the frog is placed in lukewarm water which is then brought up to a boil slowly, it will adjust to the temperature without perceiving the danger, and will gradually cook to death. “Slowly cooked to death” is a good way to explain burnout. “Death by a thousand papercuts” is another applicable phrase. It’s not always easy to pick out a particular detail that leads you to burnout; it’s usually a side effect of trying to do too many things at once (even if they’re all good things) or having to do too much that takes energy away from you rather than giving you energy. I recently gave a talk at Southeast Ruby Conference about this very topic (see below for my slides and video of the talk). For those of you who are wondering why a talk about burnout is relevant at a technical conference, first of all… lucky you! You’re either in the perfect job with an amazing manager (stay there and never leave!) or (sad trombone) you’re in denial. Seriously though, burnout is a huge problem in the tech industry. 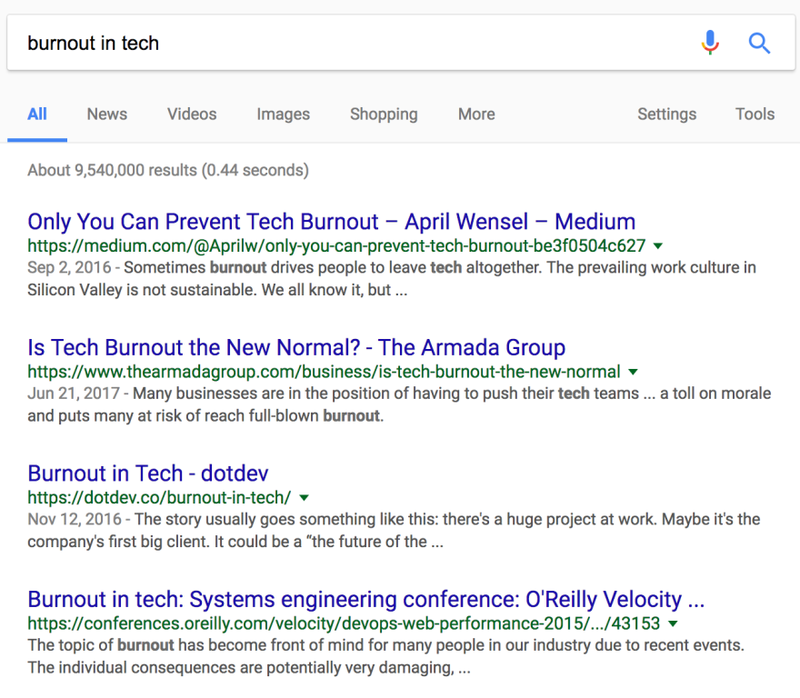 If you have any doubt, do a quick google search for “burnout in tech.” Go ahead… I’ll wait. The fact that there are 9.54 MILLION results should be the first sign that there’s an issue. So what do we do? I’ll give a few basic bullet points below, but if you want a deeper dive, I’ve linked to a video of my talk below, as well as more resources about burnout. This is the best and most important thing you can do. Taking time off to disconnect from your work and take a breather can sometimes be enough to give you the energy to keep going. 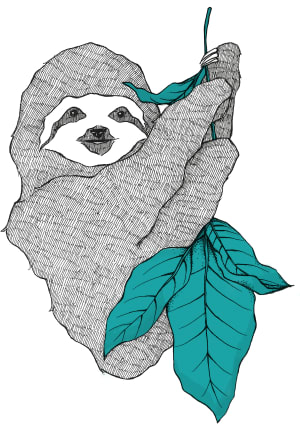 Set up your email auto-response; mark yourself as “away” on Slack and turn on “Do Not Disturb”; disable notifications on your phone; do whatever you need to do to prevent work from being front-of-mind during your time off. This played a big part in bringing me back to “normal” when I burned out a few years back. I made a list of things that weren’t only “net energy,” but “pure energy.” This means that if getting together with friends energizes you, but also requires a lot of energy to put together, it’s not pure energy. Choose things that you know without a shadow of a doubt will leave you energized. For me, this includes going to the beach, reading a good book, watching a favorite movie, listening to music at full blast and singing along, exploring a new neighborhood in San Francisco, and going for a meandering walk with my dog. Airlines are constantly reminding us to put our own oxygen masks on first. This isn’t because airlines want children or people with disabilities to go without oxygen for longer… it’s because if we aren’t getting oxygen, we can’t be expected to help others. So putting our own oxygen mask on first (aka taking care of ourselves, setting aside time just for us, being selfish sometimes (hint: it’s not a bad thing!)) is essential. If you’re a manager, it’s your responsibility to ensure the success of your team. While you obviously can’t control what’s going on in your team’s personal lives, keeping a pulse on how each member of your team is doing is an incredibly important part of your job. How can you do this? These meetings shouldn’t be a time to check the status of day-to-day work or current projects. Rather, they should be a check-in about how your employee is feeling about their work. Is there too much on their plate? Are they in over their heads with their current tasks? Are there things they’d like to be working on to further their careers? What projects would they like to be involved in going forward? How do they feel about the team structure? The company? Asking these questions on a regular basis can make sure that nothing catches you off guard, and can also help your employee know that they can express their feelings without repercussions, which leads to a more honest and open relationship. At a previous job, I had a manager who would keep track of how often each of us took time off. Not in a micro-managing way, but simply to make sure that we were regularly taking time away from work, for our own health as well as the health of the team. If he noticed that we hadn’t taken any days off (personal or vacation) that month, he’d ask us to take one day off the following week, and encourage us to plan a vacation for the following month. He knew that quite simply if we took time off to refresh ourselves, we’d be better at our jobs. There are more resources about burnout coming out of the woodwork as more and more people start talking about it. I’ve listed my favorites below. If you know of others, let me know on Twitter– I’d love to hear about them! So glad to see more content about this issue, and thanks for those books recommendations! I'm glad it's helpful! And I completely agree about needing to have more content about it. 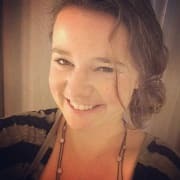 I've been able to speak more about it thanks to MHPrompt -- an org that provides funding for travel expenses for speakers willing to talk about mental health issues at conferences.